Mention the Temple Bar and my thoughts inevitably turn to a pub. It was close by East Lane (or East Street) market in London’s Walworth Road, SE17, where far too many pints of Bass IPA were sunk after work, often whilst playing endless games of space invaders. Who said men can’t multi-task? Sadly, the pub’s closed now, as is Carter Place Police Station that used to sit conveniently, and reassuringly, next door. But the market, where it was rumoured you could buy anything if you had the right cash, is still going strong. None of which is anything whatsoever to do with the Temple Bar that you’ll now find sitting between St Paul’s and Paternoster Square. In fact, this construction is Temple Bar Gate. Temple Bar marks the boundary between the City of London and the City of Westminster a little to the west, the point where Fleet Street in the City turns into the Strand (and vice-versa). The name comes from the medieval order of the Knights Templar, whose headquarters was a few feet to the south and whose church is still there. 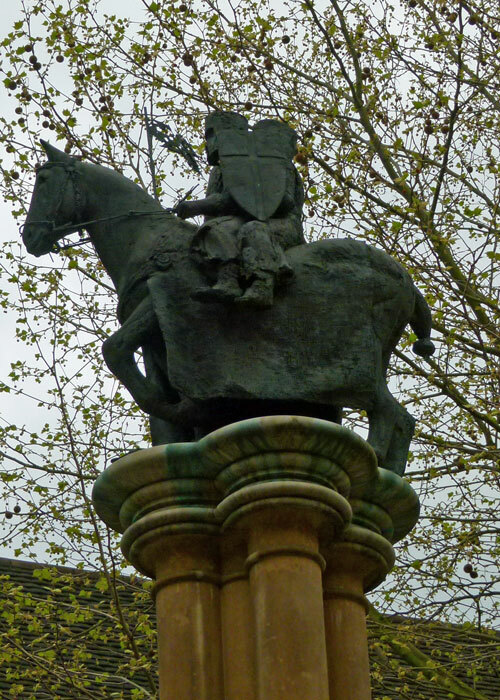 The bar was erected – probably in the form of a chain between posts – in the middle ages to help regulate trade; it was never a defensive barrier, or part of the City walls. By Tudor times, Temple Bar had become a gated wooden house, possibly used as a prison, and the background to many historical scenes and ceremonial royal processions. Even now, on some state occasions the monarch waits at Temple Bar for permission from the Lord Mayor to enter the City – a piece of ritual that dates back to the celebration of the defeat of the Spanish Armada during the reign of Elizabeth I in 1588. Temple Bar Gate survived the Great Fire of 1666, but Charles II wanted it replaced and a new one, (probably) designed by Sir Christopher Wren and built of Portland stone, was built. In place by 1672, it cost £1,500. A grand central arch was flanked by two pedestrian gateways, with statues of Charles II and his executed father, Charles I, set into niches on the eastern entrance and statues of James I and Elizabeth I (some say it is James’ wife, Anne of Denmark) on the west, leaving the City. 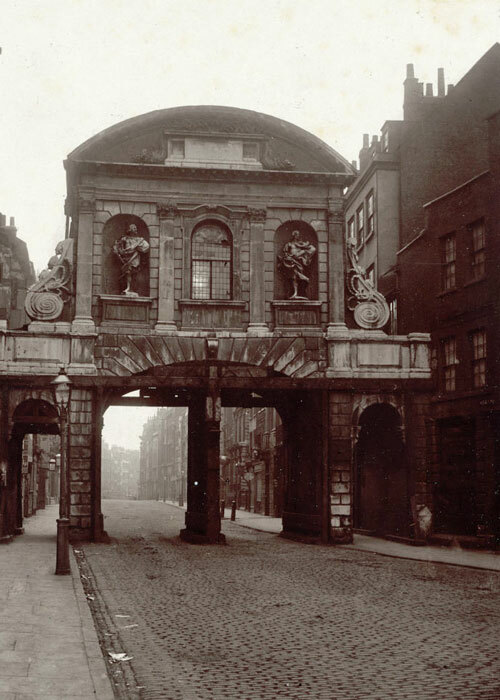 As its predecessor had been, the new Temple Bar Gate was a showcase for the heads of traitors, mounted and displayed from the roof; the last such gruesome use was in 1746, following the Stuart rebellion of the previous year. In 1878, it was decided to widen the road. But instead of just demolishing Temple Bar Gate, the enlightened folk at the Corporation of London had it dismantled, stone by stone (about 2,700 of them); each stone was numbered and carefully stored. This seems to be a remarkable decision for the time; it must also have been quite unusual. Lady Meux, reputedly one-time banjo-player and barmaid (though definitely not in Walworth Road – I’d have remembered), persuaded her husband, Sir Henry Meux, a wealthy brewer, to purchase the dismantled Temple Bar Gate in 1887 and rebuild it at their pile, Theobalds Park, in Hertfordshire. Henry died in 1900, but Lady Meux – Valerie to her friends – used to entertain in it; allegedly. She died in 1910, the family sold the estate in 1929 and the once-proud Temple Bar Gate gradually deteriorated. A report of 1981 in ‘History Today’ talks of its collapsed roof, broken windows and walls daubed in graffiti. However, there is a happy ending – kind of. A Trust was set up in the 1970s with the aim of returning the structure to the City of London and, in 2004, the restored and rebuilt Temple Bar Gate was officially opened in its new position, where you can see it, and walk through it, today. It cost just over £3 million. I gather you can rent out the room over the top for dinner parties. Meanwhile, in 1881, a new memorial was unveiled on the site of the old Temple Bar, outside the Royal Courts of Justice. 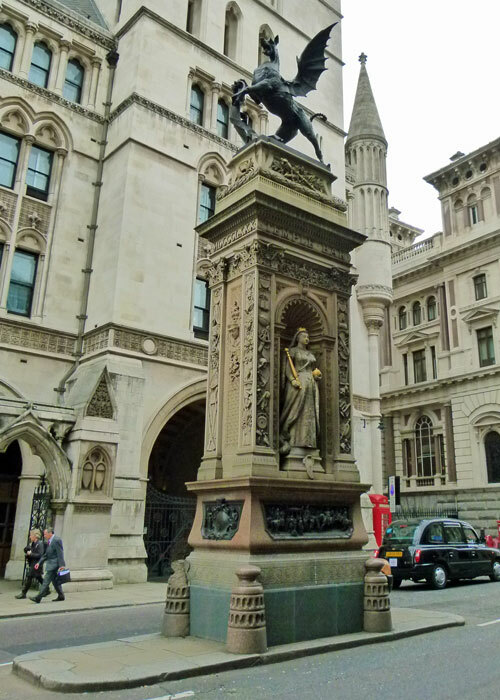 Designed by architect Horace Jones, on the top it features the dragon of the City of London, with a statue of Queen Victoria on the north side and, on the south, one of the then Prince of Wales, later Edward VII – reputedly the last royals to pass through old Temple Bar before it was dismantled. You wouldn’t expect that kind of thinking, numbering and restoring the gate, in the late 19th century. Thank you for sharing more of your history, it’s wonderful to learn these new things and places and seeing how it was too! Well, now I have to get out my Sarah Caudwell mysteries because they are set in and near the Royal Courts of Justice and when I saw the title of your post I thought Temple Bar sounded very familiar to me. I could be wrong, probably am, but it’s sticking with me and now it’s a visual! I shall have to look up Sarah Caudwell! Another interesting snippet of English history. We saw this in London and NOW I know the story behind it! Thank you! Also, we went to Temple Church and….even though I was told it was worth visiting, it seemed cold to me, more of a monument to law and lawyers. What do you think? I agree about it being a monument to law and lawyers. But that’s the basis for many of our freedoms, so I think that’s OK. Even if some lawyers are missing chunks of human DNA. The gate looks very fine, restored in its new setting. The idea of mounting and displaying traitors’ heads in public was so gross, I would have avoided the area. And kept the children away. By the way I do understand that the fear of Stuart rebellions was ongoing. I’m sure many children would have thought it was a treat..! Fascinating, and so interesting to see the Temple Bar Gate, famous from literature and other sources, back in London. 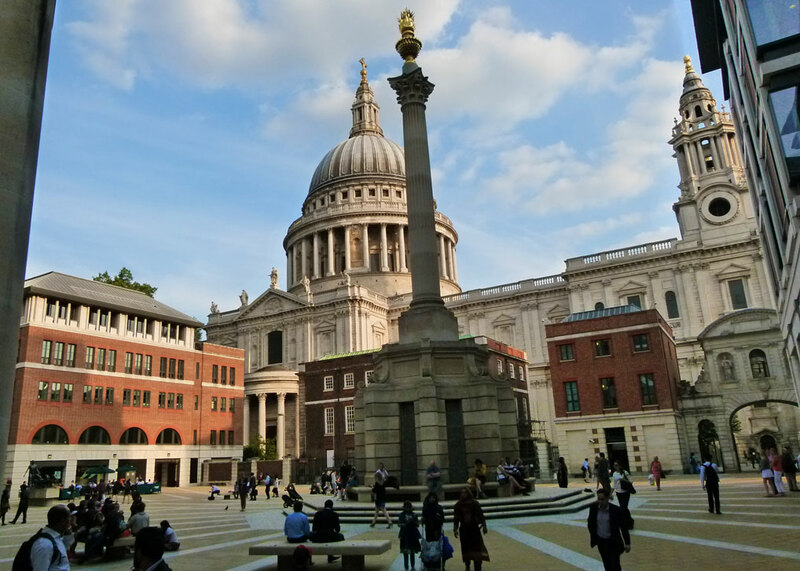 If I’d known it was there, we could have gone for a look when we went to St Paul’s last September on our trip to London. So near and yet so far! I am ashamed to say that the restoration of the Temple Bar Gate completely passed me by! I am pleased it is back where it should be (well, nearly). What really happened at Orford Ness?